A City Turns To Lettuce Fields To Grow High-Tech Startups : All Tech Considered Salinas, Calif., is just an hour from Silicon Valley, but production at many local lettuce farms is decidedly low-tech. City officials here decided it's time for an upgrade — and have hired a venture capital firm to help Salinas transition into a high-tech agricultural hub. Courtesy of Foothill Packing Inc.
A lettuce thinner created by an agricultural tech startup uses cameras and sensors to thin lettuce rows. Salinas, Calif., has hired a venture capital fund to help it attract other high-tech agricultural companies to the area. Salinas is just one hour south of California's Silicon Valley, but generations behind when it comes to technology. Many of its sprawling lettuce farms are stuck in the era of rakes and hoes. City officials are hoping to change that — and also spur some job growth — by investing in high-tech agriculture. At Taylor Farms in Salinas, Andrew Fernandez, the company's vice president of product, is stepping on heads of crunchy romaine lettuce, making his way over to a very big tractor. 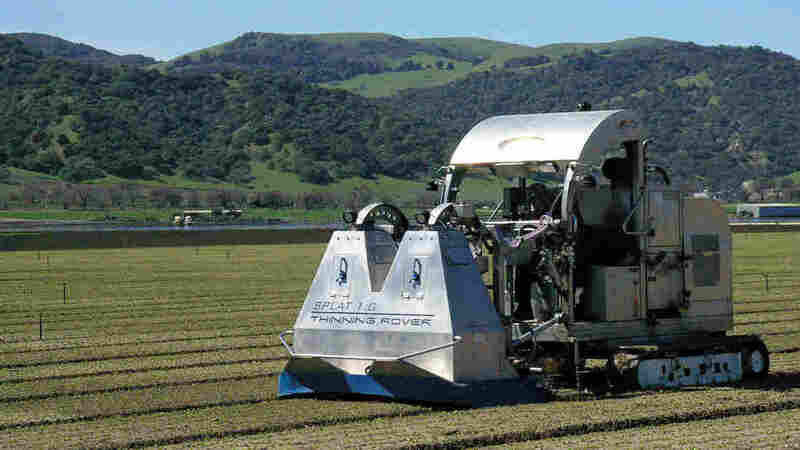 It's a water jet knife machine, and it's on the cutting edge of lettuce farming technology. Water pistols shooting at 20,000 pounds per square inch are supposed to pick the lettuce out of the ground. But the water jet knives keep blowing the lettuce heads apart and killing the crop, Fernandez says. So he's willing to change his product to something this new machine can handle. "So we're spending money and time right now to try to figure out an upright, light-bulb-shaped romaine lettuce that tastes the same as iceberg, that handles the same in the process," he says. Producing lettuce is backbreaking work — far behind tomatoes and cotton when it comes to machine automation. But now, fewer and fewer migrants are coming here from Mexico, so farms like Taylor have to invest in technology. That worker shortage is creating an opportunity for people like Tom Taggart, the technology director at Foothill Packing, an agricultural-tech startup in the city. He's demonstrating a lettuce thinner that's controlled by a MacBook. "Inside this compartment up here, we've mounted a mini Mac computer ... and it houses the lettuce program that does all this magical stuff," Taggart explains. "So the driver, who probably has limited computer aptitude, can get on here and operate this at the lowest common level," he adds. "It's a touch screen and just a push of a series of buttons." The tractor thins out heads of lettuce using cameras and sensors. They direct the nozzles to spray a killing agent. "The system says, 'Burn these, save that,' " Taggart explains. The final product: Heads of lettuce that are exactly 10 inches apart. And the MacBook sends off a digital record of the crops in real time. "This goes through the Internet, right into our accounting department, so they can do the billing," Taggart says. "Pretty slick stuff." The smart tractor seems very slick, but it's pretty simple when you consider what Salinas' neighbors over in Silicon Valley are doing with their digital tools. The city of Salinas is trying to speed up this game of catch-up by becoming an investor. "We've put in close to $300,000," says Ray Corpuz, Salinas' city manager. He says the city has something no one else has: the best lettuce fields in the country. So why not turn them into laboratories and attract tech investors? The city has hired a venture capital firm, San Jose-based SVG Partners. The venture fund is trying to raise $50 million to pay for a startup incubator — a common way to attract talent in Silicon Valley. "We're actually setting up a new business model, actually, for ... most local governments, for most cities," Corpuz says. "None of them, that I know, in the state of California are doing this." Corpuz says it's a dramatic move. The midsized city is known for gang violence. Last year the single largest employer, Capital One Bank, shut down its local branch and more than 800 people lost their jobs. "So the economic setback was probably $60 million annually in payroll, which was quite a hit for us," Corpuz says. These unemployed workers aren't going to pick lettuce for $9.50 an hour, but the thinking is, maybe they'd work for ag-tech companies. When Corpuz tells other city managers about the venture fund effort, they have their doubts. "It's risky. Sounds like a great idea, but it sounds risky," they tell him. But Salinas residents don't have much to lose by trying. On a recent Saturday morning, college students and laid-off workers from Capital One showed up at the local community college to practice pitching their ideas. A vice chair with the venture capital firm is here to coach them. Jessica Landa, a local college student, is here to pitch an idea for green homes. "Basically, the pocket house is a tiny micro-grid home, and it's built with several sustainable aspects, such as solar panels so that you don't have to connect to a macro-grid," she explains. The next step is for the Salinas native and her counterparts to take their plans to Silicon Valley investors.